Coasteering is a unique and exhilarating combination of cliff jumping, rock climbing, sea level traversing and sea cave exploration. Guaranteed to be lots of fun it continues to be our most popular activities year-on-year. We explore the area around Rumbling Kearn, there are wash off's, jumps and caves to explore. Jump heights vary from a few feet to 30ft, although the higher jumps are tide dependant. None of the jumps are mandatory, and our experienced staff will help you get the most from the session guaranteeing lots of fun and unforgettable memories. We also try to take plenty of pictures on this trip and post them to our Facebook Page. Click Here to visit our facebook page. 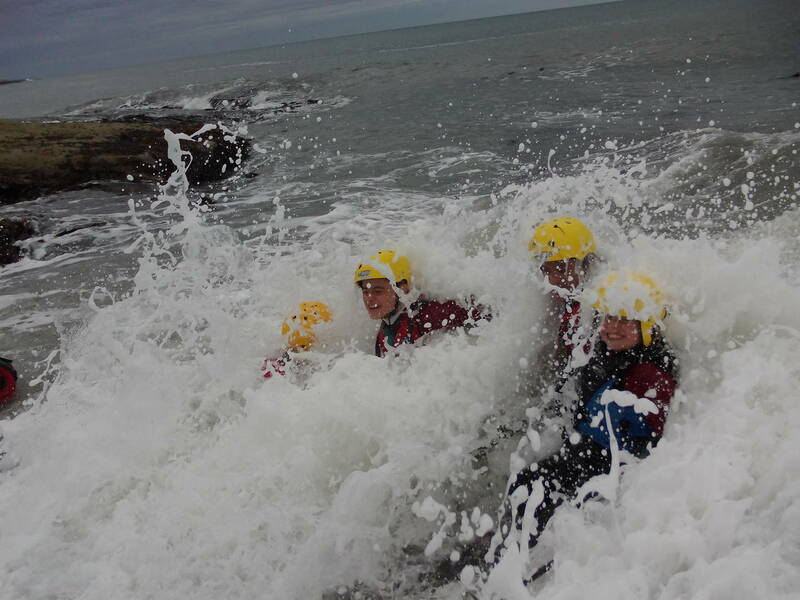 When do we offer Coasteering? Our season runs from the 1st March to the 31st October.If you wish to book outside, this time, please contact us. Morning Sessions start at 10am and afternoons at 1.30pm. Sessions run for 3 hours. The minimum age for this activity is 8yrs old. To see which time slot is available click on the time and it will allow you to book. We supply your wetsuits and all safety equipment.